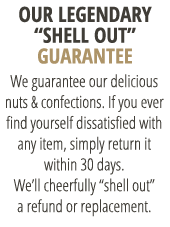 Our Super Extra Large Virginia Peanuts "blistered" and seasoned with fine sea salt and fresh cracked black pepper. 18 oz. vacuum-packed tin. Oil Roasted Peanuts, Salt and Pepper Seasoning: Salt, Pepper, Dextrose, Maltodextrin, Xanthan Gum and Silicon Dioxide (2% Max to Prevent Caking), and Peanut Oil. Manufactured on Equipment that also Processes Peanuts, Tree Nuts, Soybean, Wheat and Milk Products. Contains: Peanuts. I always order them for special occasions. They are gone before you know it. The Sea Salt and Pepper Peanuts are my favorite snack right now. I had a dream of swimming in them. My husband's second favorite. First is the salted gourmet peanuts. Tried something new and they are fine..
Like the mix of spice/tang. Online website provides complete and easily read information about products. Very timely delivery. A GREAT experience. The salt & pepper peanuts are fantastic. Everytime I order them they are consistently excellent! Have been getting my peanuts here for around 40 years. They are the best in the USA. I ordered the Maple Bacon flavored peanuts. They are simply delicious and I will definitely order them again! Have gotten my peanuts from you for I would guess 30 years. They are the best every year. All year. Service is outstanding also. 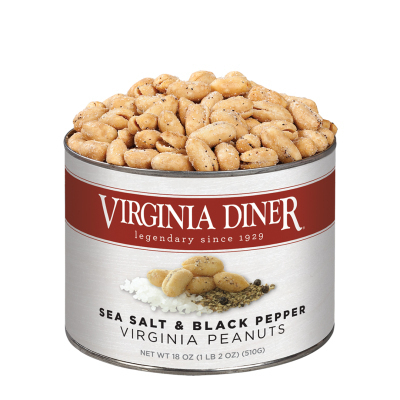 I have been buying various salted/flavored peanuts from VA. Diner for the past few years. Always buy in quantity during the Christmas holidays for myself and for presents to friends. I bought my first can of Old Bay Virginia peanuts at the Richmond airport and was instantly addicted. But, my addiction was cured when I found the Dill Pickle seasoned peanuts. They are delicious! You can't go wrong with any of them! VA Diner has the best peanuts. Salt and Pepper Peanut tins are the perfect gift for anyone. Always appropriate, nice to share. Knock offs are simply not as good. Loved the salted peanuts, always a favorite with us.